Order from Barnes & Noble or Amazon Canada. Find a copy at your local bookseller in the U.S. and Canada. A tree planter’s vivid story of a unique occupational subculture and the magical life of the forest. 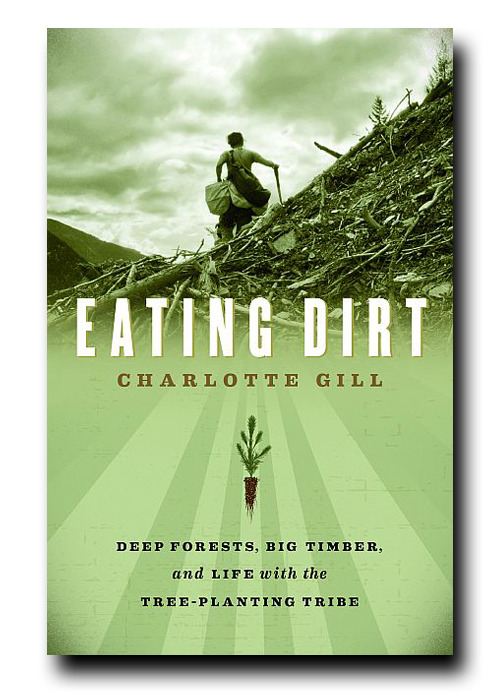 Eating Dirt is an extended postcard from the cut blocks—a vivid portrayal of one woman’s life planting trees. This literary journey follows tree planters through a year on the job, through bugs and bears, remote camps and logging towns. It offers a glimpse into the unique subculture of those who work at one of the dirtiest jobs left on earth among the world’s last giant trees. The story also traces the seasons of the forest and the remarkable life cycles of trees. Charlotte Gill spent seventeen years working in the forests of Canada. During her career, she encountered hundreds of clear-cuts, each one a collision site between human civilization and the natural world, a complicated landscape presenting geographic evidence of our appetites. Charged with sowing the new forest in these clear-cuts, tree planters are a tribe caught between the stumps and the virgin timber, between environmentalists and loggers. In Eating Dirt, Gill offers up a slice of tree-planting life in all of its soggy, gritty exuberance, while questioning the ability of conifer plantations to replace original forests that evolved over millennia into complex ecosystems. She looks at logging’s environmental impact and its boom-and-bust history, and touches on the versatility of wood, from which we have devised countless creations as diverse as textiles and airplane parts. Eating Dirt also eloquently evokes the wonder of trees, which grow from a tiny seed into one of the world’s largest organisms, our slowest-growing “renewable” resource. Most of all, the book joyously celebrates the priceless value of forests and the ancient, ever-changing relationship between humans and trees.